Scientists at the Department of Energy's Lawrence Berkeley National Laboratory (Berkeley Lab) spent a decade developing world-class modeling and monitoring capabilities to pinpoint factors behind the success of Sonoma's riverbank filtration system. They were turning their attention to investigating the potential impact of extreme events, such as storms and wildfires, when disaster struck. Suddenly, their experimental approaches to predicting how the system would respond to hypothetical situations are being used to explore real-life perturbations. Catastrophic fires in Northern California burned more than 110,000 acres in Sonoma and Napa counties last month – including 8 percent of the Russian River watershed. Now with the rainy season underway Berkeley Lab's research – which seeks to understand how the hydrology and microbiology of the surface and groundwater system respond to extreme events – has become even more critical. "We were studying the potential impact of fires on the nutrient, solute, and metal delivery to the river," said Berkeley Lab researcher Michelle Newcomer. "With this unfortunate turn of events our developed approaches are ready to address real questions about water availability and water quality." The Sonoma County Water Agency is supporting Berkeley Lab to assess the impact of the recent fires and any post-fire storms on the hydrological and biogeochemical conditions of the water quality as it moves through the Russian River and groundwater system, the main source of drinking water for 600,000 residents in Sonoma and Marin counties. Berkeley Lab has been collaborating with the Water Agency and scientists from the U.S. Geological Survey (USGS), who are helping to collect samples and perform water quality analyses, respectively. "The timing of the fires has presented a big challenge. Coming so close to rainy season, folks who get their water from the Russian River are worried about potential impacts of runoff from the thousands of homes destroyed and thousands of acres scarred," said Jay Jasperse, chief engineer and groundwater program manager for the Water Agency. "The partnership with Berkeley Lab and USGS will provide vital information." Data collected from this program will also be helpful in assessing potential impacts to other water supply systems within and downstream of the affected areas, as well as potential ecosystem affects. "As soon as the fire happened, we mobilized the next week to identify a series of measurement nodes at key locations in the watershed to collect a time series of water samples," said Susan Hubbard, the Associate Laboratory Director of Berkeley Lab's Earth and Environmental Sciences Area. "We're working to understand how changes in hydrological conditions influence the interactions between microbes, minerals, and fluids in the surface and groundwater, that is, how these interactions change before, during, and after storms and what it means for water availability and water quality." 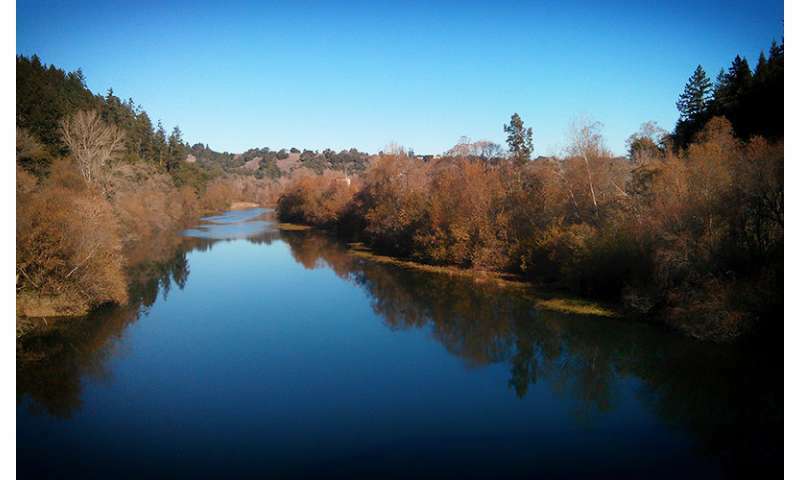 The Water Agency's riverbank filtration system, located on the Russian River near Forestville, pumps groundwater from approximately 20 meters below the river that has been naturally filtered by sediments and microbes in the ecosystem. The advantage of such a system is that it greatly reduces or even eliminates the need for chemical pretreatment to get rid of pathogens and contaminants. "It's a natural, sustainable way to filter the water," Newcomer said. The Berkeley Lab scientists have been studying hydrological-biogeochemical processes that are critical to successful riverbank filtration systems. Through advanced surface-subsurface models that can simulate complex interactions, Newcomer has identified several key controls. "We believe that successful riverbank infiltration requires two things: The aquifer below and adjacent to the river must have sediments that are the right type and size, made up of the right minerals; and the ecosystem of the river must provide a lot of the sustaining food for the microbes in those sediments," she said. "It's the combination of these two things that are helping this filtration system maintain its productivity, and these two factors change with seasonal and operational practices." Berkeley Lab's research has been able to model the key factors in maintaining high quality water production while optimizing water infiltration and pumping. The researchers found that the microbiomes are a key control factor, and they have published a number of studies over the years based on the Water Agency's site, such as one on riverbank bioclogging, a process where microbial growth can block the infiltration of water to the collector wells. Newcomer has developed a numerical flow and reactive transport model of water and geochemical constituents in the subsurface. "It's a state-of-the-art model and is the first of its type to have microbial capabilities built into the model," she said. "With the microbial information as well as the flow and geochemical information it can help guide an agency with its pumping decisions, and we are now using the model to explore responses to fire." The current phase of the research is focusing on collecting data from throughout the watershed and using the models to understand how ash-based carbon generated by the fires and mobilized by winter storms will impact infiltration rates and microbial growth. Carbon is an energy source for the riverbed microorganisms and thus influences how much water can infiltrate into the aquifers and how fast contaminants can degrade. The danger is that potentially toxic chemicals common in a plethora of household items would find their way into the groundwater after a fire. "Mostly we're worried about chemicals from personal household items, such as fire retardant in furniture, paint, pesticides, and items that burned in people's homes," Newcomer said. "We're also worried about metals getting mobilized, such as mercury, which is commonly found in batteries and lightbulbs." The Berkeley Lab team is not involved in emergency response to the recent fires. Rather, their scientific investigation and numerical capabilities will enable the Water Agency to make more informed decisions about how they manage their riverbank filtration system, both in the near and longer term. The approaches should be transferable to other sites, and may also pave the way for more efficient design of riverbank filtration systems that are resilient to extreme events. "We are encapsulating our understanding about the connections between hydrology, fire-derived carbon, geochemistry, and biology in a predictive mode that can enable the Water Agency to best make decisions about how to optimize their riverbank filtration system and deliver water to its customers," Hubbard said.